With 291,826 residents in 2010, Anchorage is Alaska's largest city and constitutes more than 40 percent of the state's total population. Anchorage has been named All-America City four times by the National Civic League. It has also been named by Kiplinger as the most tax friendly city in the United States. 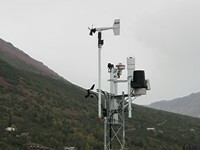 longitude : W 149° 42' 38"
latitude : N 61° 05' 58"
Station: 1275 ft above sea level. 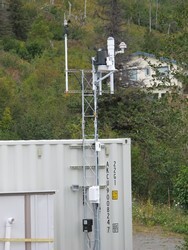 Anenometer: RM Young 5103 Wind Monitor, 25' above ground level (agl). Temp & Humidity: Davis #6930 Temp/Hum Sensor in Aspirated Radiation Shield, 10' agl. Rain: Davis #7852 Heated Tipping Bucket Rain Collector, 7' agl. 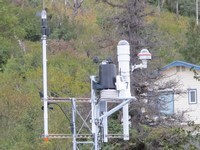 Solar & UV: Davis #6450 & #6490 Solar Radiation and UV Sensors, 25' agl. Camera 1: Orion Starshoot Color AllSky Camera, 25' agl. Camera 2: NMSU B&W SkySntinel Meteor Camera (node 67), 25' agl. Webcams: Olympus SP-500UZ 6mp Color Digital Cameras.